I have been a Juice Beauty devotee since the beginning of the year after viewing author Karrine Steffans’s blog posts in which she sang its praises. Initially, I surfed the company’s website, thought the products were too pricey and put off ordering. This past January, I took the plunge and ordered the Blemish Clearing Cleanser, Blemish Clearing Serum and Oil-Free Moisturizer and fell in love. I became dedicated to Juice Beauty products, however, after going back to my previous skin care line (like I said, I found Juice Beauty rather pricey) and cringing as my skin reacted negatively to the change. I broke out in little patches all over my cheeks and chin. Mind you, my previous skin care product was for sensitive skin. When I switched from my previous skin care routine to Juice Beauty, I did not have the same reaction; only when I switched from Juice Beauty back to my “sensitive” skin product line. That’s when I knew the Juice Beauty product line is truly organic. 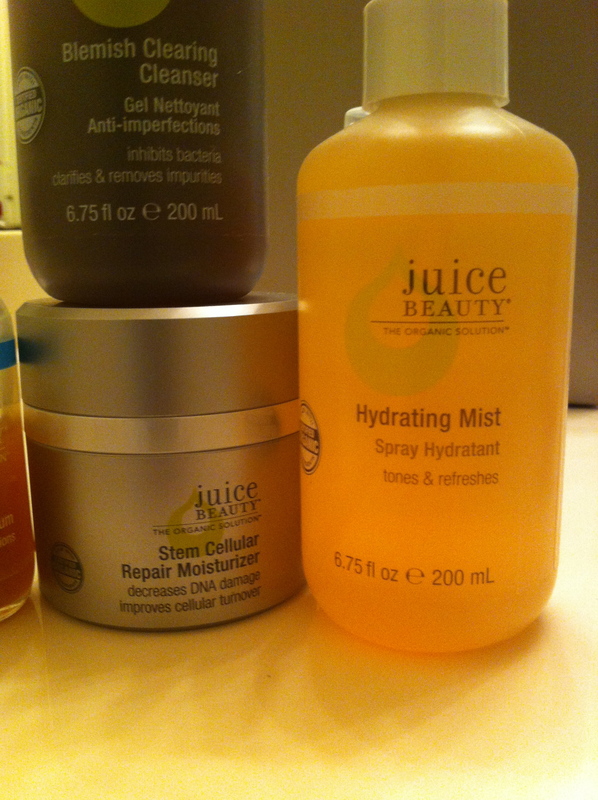 I recently added the Hydrating Mist and Stem Cellular Repair Moisturizer to my Juice Beauty collection and, like the Blemish Clearing Cleanser and Blemish Clearing Serum, these products are winners. The Hydrating Mist is a light and refreshing toner that I spritz on after cleansing my skin with the Blemish Clearing Cleanser. Only a light mist is needed. I have read some reviews where there were complaints that the Hydrating Mist made one’s skin too sticky. I have not experienced that problem. After letting the Hydrating Mist air dry, I apply the Blemish Clearing Serum. I finish with the Stem Cellular Repair Moisturizer. This moisturizer is light and has a clean, lemony scent. It has softened and brightened my complexion. I have also noticed an improvement in my skin’s texture. The jar comes with a pump that releases just the right amount to apply. It is one the more expensive products on the company’s website, but it is well worth the money. I highly recommend Juice Beauty’s Hydrating Mist and Stem Cellular Repair Moisturizer if you are looking for an organic skin care line that produces noticeable results.